Organic gourmet Sweet and Sour Marshmallows beautifully packaged with a completely more'ish consistency created from the finest organic ingredients and natural flavours. These are nothing like the fluffy flavourless pink and white marshmallows we put on top of our hot chocolate. Each flavour is completely unique and delicious and based on an individual set of characters quirkily illustrated on the packaging sleeve. The Lovegoods have been all over the world; yoga retreats on idyllic coasts, festivals in endless meadows, gatherings in hidden forests, and moonlight dances on exotic beaches. These days, they stay a little more local, and the van breaks down a little more often, but the journey is the same. A free spirit, a lack of clothes, a sour little lemon tree and the sweetest kitten called strawberry. Just like their travelling companion, the Lovegoods are an odd couple, but a perfect match. The Mallows are made with passion and born from a desire to make the best organic gourmet marshmallows. 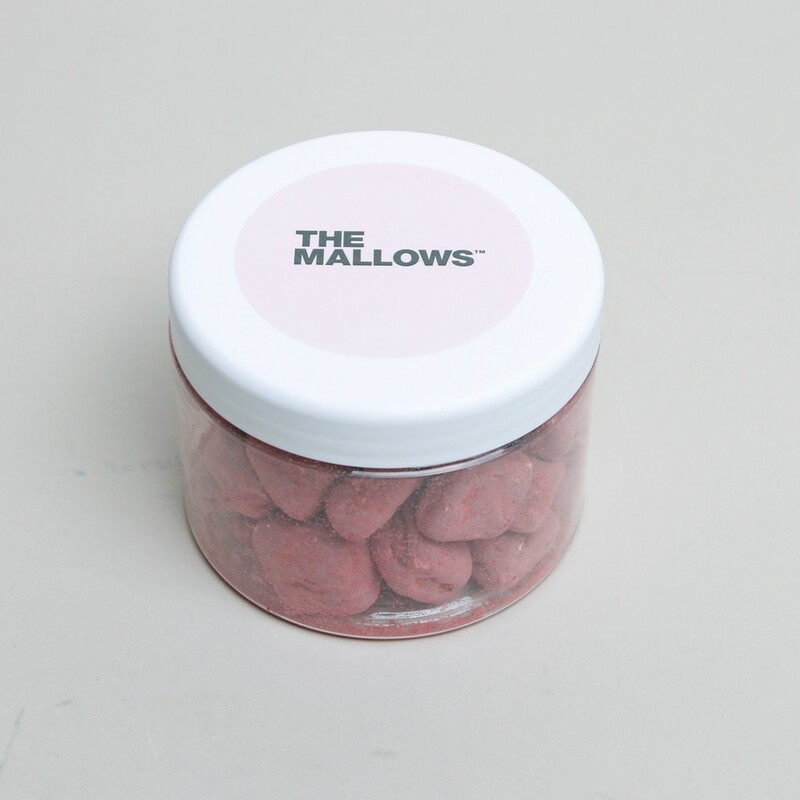 The philosophy behind The Mallows is an uncompromising approach to ingredients; "only the best is good enough". We have a dedication to premium ingredients, we appreciate the organic choice and are proud of our handcrafted marshmallows. The taste of our marshmallows are created to give you a unique taste sensation. Our assortment includes both fluffy marshmallows and marshmallows coated in luxury chocolate. Our marshmallows are organic and we only use natural flavours. To share our passion for this "special guilty pleasure", we created characters to describe the emotions and story behind every single marshmallow. 3% milk chocolate* (cane sugar* cocoa butter*, whole milk powder*, cocoa mass*, emulsifier: soya lecithin*), glucose syrup*, cane sugar*, 14% white chocolate* (cane sugar*, cocoa butter*, whole milk powder*, emulsifier: soya lecithin*), water, dextrose*, 2,1% strawberry* (freeze-dried), gelatin (bovine), 0,1% acid: citric acid, natural vanilla flavour. * = organic. Minimum 35,3% cocoa solids.